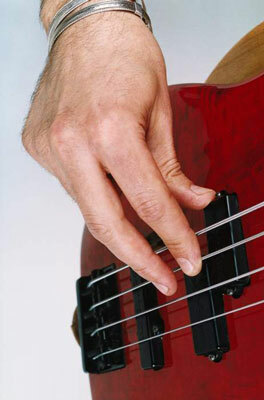 Using the index finger (i) or middle finger (m) of your right hand, strike the lowest string. Alternate between your i and m fingers (striking the string with one finger at a time). Keep the sound even as you alternate. Don’t lift your fingers really high and slap them down. If you slap the string, you’ll create a lot of unwanted fret noise. Don’t pluck the string up, either. If you pluck the string up, it will vibrate over the pickup in a certain way that produces a very thin sound. Instead, your angle of attack (your strike) should be into the instrument, making the tone full and round. This technique gives you an authoritative and punchy sound, which is exactly what you want as a bass player. Play evenly on each string, alternating between your i and m fingers. Aaaaaah . . . can you feel those calluses building up? You want those calluses; believe me. You better make your fingers tough and hard so you can strike the string all day long without any pain (or blisters). As you play, you’ll probably notice that your striking fingers are coming to rest on the next lower string when you play the adjacent higher string. This technique is correct; it helps mute the strings that aren’t being played. When you play the lowest string (the E string), your fingers should come to rest against your thumb (which is firmly anchored to the thumb rest or the pickup, right? ).